The referendum for independence of Armenia was held on September 21, 1991. Based on the results of the referendum (99% voted for independence), the parliament (The Supreme Soviet of the Armenian SSR) adopted the Declaration of Independence and announced the independence of the Republic of Armenia. The Constitution: Was adopted on July 5, 1995, through a popular referendum. Amendments adopted by referendum on 27 November, 2005. The system of Government: The Republic of Armenia has a presidential system of government. In accordance with the Constitution, the President ensures compliance with the Constitution, the normal operation of the legislative, the executive and the judiciary branches, and serves as the guarantor of sovereignty, territorial integrity and security of the Republic. The President is elected by the citizens of the Republic of Armenia for a five-year term. The Executive Power: The executive power in the Republic of Armenia belongs to the Government of the Republic. The Government is composed of the Prime Minister and the Ministers. The Legislative Power: Legislative power in the Republic of Armenia belongs to the National Assembly. The National Assembly is a 131-seat body. The Judicial Power: In the Republic of Armenia, justice is carried out by Courts in accordance with the Constitution and the Laws of the Republic of Armenia. The Republic of Armenia, the smallest of the three Trans Caucasian republics, is a landlocked mountainous country bounded on the north by the Republic of Georgia, on the east and southwest by Azerbaijan, on the south by Iran and on the west by Turkey (FIG 1). The northern border is 196 km long, the border with Azerbaijan is 913 km, the southern border has a length of 42 km and the western - 280 km. The land area of the republic is 29 743 km2. The terrain is defined by the high Armenian Plateau with mountains, little forest and fast flowing rivers. The average height above sea level is about 1800 meters. The climate is highland continental with hot and dry summers and cold winters. Annual average temperature varies from -2.7°C to 13.8°C. The coldest month is January (from 1.2°C to -12.8°C) and the hottest months are July and August (from 25.8°C to 8.7°C). Summer temperatures may rise up to 42°C, winter cold has maximum of -46°C. Summer relative humidity is 32-45% (July-August), winter relative humidity is 80-90%. Annual rainfall varies from 220 mm to 900 mm. Maximum precipitation is usually during May-June and minimum precipitation is in winter. The annual maximum sunshine is 2780 hours (Lake Sevan area), and minimum 1930 hours (Ijevan). The average intensity of solar radiation on the aclinic plane on a cloudless day is 700 kcal/m2. The annual average wind velocity varies from 7.7 m/sec to 1.0 m/sec. The population of Armenia, according to the country statistical data, is about 3.274 million (as of 01.01.2012), of which 64.0% live in urban areas. 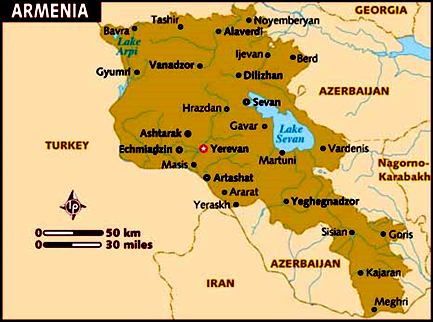 Armenia is a densely populated country with a density of 110 person/km2. The historical population information is shown in Table 1.
a Formal data of the census of population. Source: IAEA Energy and Economic Database; Data & Statistics/The World Bank; National Statistical Service of RA. The population average growth rate from 2001 to 2012 is about 0.17 %. The concentration of population is not equal in different areas of the republic. The Ararat Valley is the most populated territory of the country with the density of 245 person/km2. Its area makes about 26.7% of the total territory, and its population reaches to 58.8% of the total population. Yerevan, the capital of the Republic of Armenia, lies in the Ararat Valley and is home to 1.127 million people, which is about one third of the total population. The highland areas have much less population with a density of 24 person/km2. After the disintegration of the Soviet Union, an economic crisis broke out, and Armenia suffered from sharp decline in production during the period 1990-1994. The country undertook great efforts to overcome it. Since then, the situation has been gradually stabilized, and the republic is coming out of the crisis following the transition to a market economy. During the period 2000-2010, the Gross Domestic Product (GDP) has increased 447%, and the average growth rate was 18.1 % per year. The historical GDP information is shown in Table 2. GDP (millions of constant 2000-USD) 2,820 1,910 3,400 n.a. n.a. GDP per capita (PPP* USD/capita) - 2,294.1 4,097.8 n.a. n.a. Source: IAEA Energy and Economic Data Base; Data & Statistics/The World Bank; Country Information. Armenia is not rich in mineral raw materials. There are only a few items of considerable industrial value: copper, bauxite, molybdenum, precious metals, perlite, diatomite and coal. This factor mainly determines the economic structure of the republic. There has traditionally been very little heavy industry. The manufacturing sector has a prevailing share in GDP. The main sources of energy, traditionally used in Armenia, are: oil products, natural gas, nuclear energy, hydropower and coal. Hydro and a small amount of brown coal are the only domestic sources of energy, which are exploited. The republic has no oil and some gas reserves (not exploited). The geological forecast says that some quantity of uranium may be in Armenia, that’s why in July 2008 a Russian – Armenian joint venture was established for uranium geological exploring and mining. The energy reserves are shown in Table 3. To meet its energy requirements, Armenia has to import gas, oil products and nuclear fuel. (*) Sources: 20th WEC Survey of Energy Resources, 2004 and Uranium 2005: Resources, Production and Demand ("Red Book"), IAEA Energy and Economic Data Base, Country Information. (1) Coal including Lignite: proved recoverable reserves, the tonnage within the proved amount in place that can be recovered in the future under present and expected local economic conditions with existing available technology (2) Crude oil and natural gas liquids (Oil Shale, Natural Bitumen and Extra-Heavy Oil are not included): proved recoverable reserves, the quantity within the proved amount in place that can be recovered in the future under present and expected local economic conditions with existing available technology (3) Natural gas: proved recoverable reserves, the volume within the proved amount in place that can be recovered in the future under present and expected local economic conditions with existing available technology (4) Reasonably Assured Resources (RAR) under < USD 130/kgU (5) Hydropower and Renewable technically exploitable capability, the amount of the gross theoretical capability that can be exploited within the limits of current technology. Primary energy sources, in ExaJoule (EJ), are summarized in Table 4. To meet its energy requirements, Armenia has to import gas, oil products and nuclear fuel. * Energy consumption = Primary energy consumption + Net import (Import - Export) of secondary energy. ** Solid fuels include coal, lignite. Source: IAEA Energy and Economic Database and Country Information. Before the disintegration of the USSR, Armenia, as a part of the Soviet Union, was under the unified All-Union energy policy. The electricity generated by Armenian power plants joined the Trans Caucasian Energy System. After becoming an independent state, Armenia had to meet the open market requirements in all the branches of the industry. The energy sector and the nuclear energy sector in particular, were deeply affected by the economic difficulties during the market transition and were in need of reorganization and de-regulation. According to the Law “On Energy” of the Republic of Armenia, the main principle of the Government policy in the Energy sector is the separation of functions of economic activity, state management and regulation. According to the main regulating principle, the rights of the consumers and economic interests in the energy sector are to be balanced. According to this Law, the functions of regulation were given to the Commission on Public Services. The level of average electricity tariff is 25 drams and since 1998, was the same till April 2009, increasing to 30 drams subsequently. In March 2000, the National Assembly of RA adopted the Law “On Amendments and Additions to the Law On safe Use of Nuclear Energy for Peaceful Purposes”. In particular, one of the amendments reads: “Those objects which are of safety importance shall be constructed and decommissioned by the Law, which draft should be submitted to the Government”. In November 2004, the National Assembly adopted the Law “On Amendments and Additions to the Law On safe Use of Nuclear Energy for Peaceful Purposes” according to which the new constructed nuclear power facilities in Armenia can be owned by all kinds of owners. The radioactive waste and spent nuclear fuel remain state owned. The operators of nuclear facilities cannot declare bankruptcy. A similar amendment was made also to the “Law on Energy”. On 16 March, 2004, the amendments were made to the “Law on Licensing”, according to which it is necessary to have a license for the following activities: design, site selection, construction, operation, decommissioning, etc. of nuclear facilities, radioactive waste storage and disposal, as well as for nuclear materials and radioactive waste processing, transportation and other activities. The rules for obtaining licenses on these activities were established with the use of a number of appropriate government decrees. On 8 of December, 2005, the amendment was made to the “Law on Population Protection in the Emergency Situations” according to which, in the case of nuclear or radiation emergency at the nuclear power plant (NPP), the functions of all involved responsible organizations shall be determined by Government decree. On 22 December, 2005, Government decree N 2338 “National Plan for the Population Protection in case of Nuclear and/or Radiation Emergency at the Armenian NPP” was issued. As a result of the exercises on nuclear or radiation emergency at the nuclear power plant conducted for checking the real possibilities to use that decree, a new edition was made to the “National Plan for the Population Protection in case of Nuclear and/or Radiation Emergency at the Armenian NPP”, which was adopted by the Government decree N 194 on 17 of January, 2008. The radiation safety and protection requirements for the plant workers and population (including critical groups and the population in general) are stated in Government decrees N 1219, “Radiation Safety Norms”, 2006 and N 1489 “Radiation Safety Rules”, 2006. By Government decree N1296 of 1.11.2007, the Armenian Ministry of Energy Action Program was adopted according to the National Security Strategy. By this program, it was envisaged to put into operation the new nuclear power unit (s) immediately after the shutdown of the existing one to cover the lack of capacity. According to that document, taking into consideration the needs of country energy independence, the preference is given to a 1000 MWe nuclear power unit. According to protocol decision No. 14 “On Approval of the Concept for Ensuring Energy Security in the Republic of Armenia” of the RoA Government session No. 50, of 22.12. 2011, the importance to increase the safety level of Unit 2 and based on the importance of national energy security and independence, the necessity to construct a new unit were restated. This decision discussed also the possibility to continue the operation of ANPP unit 2 after 2016. On April 19, 2012 RoA Government decision No. 461-N “On Extension of Service Life of Unit 2 of Armenian NPP” was issued. According to this decision the Minister of Energy and Natural Resources was assigned to organize activities on development of the program on extension of service life of ANPP Unit 2 and to estimate the amount of financial resources required for implementation of activities on extension of service life of ANPP Unit 2, as well as to submit them to the RoA Government for discussion in September 2013. The Law of the RoA “On Construction of a New NPP in the Republic of Armenia” was adopted on 27 October, 2009, which will serve as a legal basis for construction of a new NPP in Armenia. The Company “Worley Parsons” was selected in May 2009 by international tender as a management company for the construction of the new nuclear power unit. Currently “Worley Persons” Company has finalized the development of “Bankable Feasibility Study” document, which is necessary for involvement of investors. As a result of “Bankable Feasibility Study” document, under Decree N1458 of the Government RA dated 3 December, 2009 for the nuclear island of a new NPP, the Russian NPP-92 (AES-92) design (capacity - 1060 MW; operation lifetime - 60 years), which has a European safety certificate, was approved. The turbine island and control system of the new nuclear unit will be selected based on a tender. Decree “On Establishment of a Closed Joint-Stock Company Aimed at Construction of a New NPP in the Republic of Armenia” was adopted by the Government of Armenia on 3 December, 2009. “Metsamorenergoatom” CJSC was established with the involvement of the RA Government and “Atomstroyexport” CJSC, which was delegated by “Rosatom” Russian State Corporation. The established “Metsamorenergoatom” CJSC is open for other investors as well. “Metsamorenergoatom” CJSC has already received the license for selection of the site for the construction of the new unit. On March 26, 2010 the “Rosatom” State Corporation and the RA Ministry of Energy and Natural Resources signed an agreement on nuclear island equipment reservation aimed at equipping of the new nuclear unit in the RoA. An agreement between the RA and RF Governments was signed on August 20, 2010 to envisage the nuclear island equipment supply provisions and is already ratified. Other nuclear unit components of the project, i.e. Turbine Island and I&C systems are subject to negotiations with suppliers. Special attention was paid by the Government on restructuring the electricity sector. A number of Laws in energy were adopted to achieve that target. A program for improvement of metering, billing and collection of payments for electricity, heat and natural gas has been implemented, together with the conversion of the accounting system to international norms and standards and annual auditing of the company's financial reports by independent auditors. A program has been implemented to organize collections through banks. Though there are difficulties in the whole economy of the country, the Government gives priority to budget payments for the electricity provided to budget organizations, as well as compensation for the electricity consumed by irrigation, drinking water, industry and electrical transport companies. The implementation of a stabilization policy, with the crucial role of restarting the ANPP, allowed the country to overcome the electric energy crisis of the post-Soviet period. Now, Armenia is covering its electricity demand completely and can ensure the export of electric energy to neighbouring countries. In the near future, however, additional energy sources may be required as the economy of the republic is recovering and the living standard is increasing steadily. For Armenia, it is critical to be involved in the regional power market that is currently in the process of formation and foresees the establishment of a circular power system of Black Sea countries, as well as creation of North – South parallel operation relations. So, in future the leading role in competition for providing services to regional power market will be given to a country which is able to produce base-load electricity from the nuclear unit with minimal emissions of green-house gases. In May 2008, the Ministry of Energy of RA was re-named and became the Ministry of Energy and Natural Resources of RA. It is responsible for the sustainable electric energy supply to the consumers, natural resource economic potential determination and other tasks relevant to those areas. It has the responsibility to define the policy for the whole Energy sector development. The Nuclear Safety Regulation State Committee under the Government of RA duties are: performing the State nuclear energy regulation and supervision over the nuclear power objects, issuing the licenses and controlling the license requirements fulfilment. Its main objective is to secure the protection of the population, the personnel involved in the nuclear industry, and the environment. The Public Services Regulatory Commission of the RA is responsible for the antimonopoly regulation. The key functions of the antimonopoly regulation are tariff regulation and licensing of entities in the energy sector. The Operator of the Electric Energy Network is responsible for the dispatching activity, and the Settlement Centre is in charge of calculation of wholesale trade of electric energy. It also approves the balance between the participants of the trade. 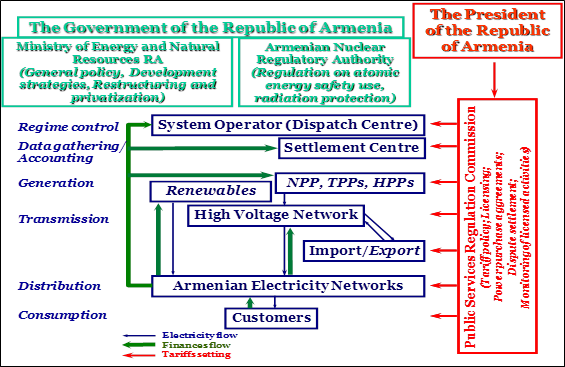 The structure of management of the Energy Sector in Armenia is shown in Figure 2. On 01.01.2013, the total installed capacity of the electric energy generating plants in Armenia was 4.01 GW(e). In 2012, electricity production was 8.03 billion kWh. Table 5 shows the historical statistics of the electricity production and its distribution by plants types. Table 6 - the energy related ratios. In Armenia in 2012, the electricity consumption was around 1808 kWh/capita. The energy consumption of Yerevan city is about 50% of the total electricity consumption in Armenia. Source: IAEA Energy and Economic Database; Country Information. A decision to construct a nuclear power plant in Armenia was made by the former USSR Council of Ministers, and the appropriate decree was issued in September 1966. In 1968, the Armenian Branch of ‘’Electrosetproject’’ Institute completed the pre-feasibility study for constructing the Armenian NPP (ANPP) under the project “The Scheme of NPP Contribution to Power Grid”. That document included a schedule to commission Unit 1 in 1973, and Unit 2 – in 1974. The technical specification to design the ANPP was developed by “Teploelectroproject” in 1968 and approved in August 1969 under decree N 1624 R.C. of the former USSR Ministry of Energy. 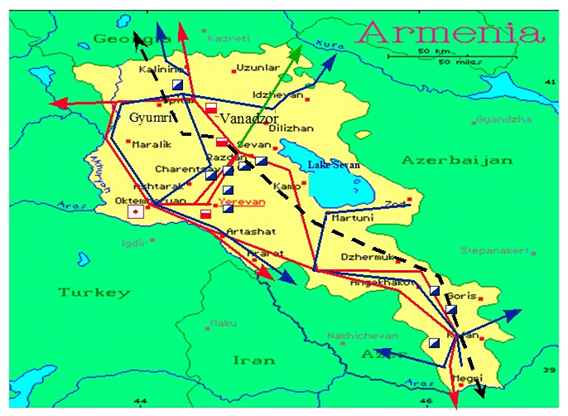 More than 20 potential sites were considered for the ANPP construction, and finally a site was selected in the western part of Ararat valley, 16 km from Turkish border, 10 km to the north-east of region centre – Hoktemberyan (Armavir), and 28 km (to the west) from Yerevan. Location of the ANPP is shown in Figure 3. In accordance with that specification, the capacity of the ANPP (first stage of construction) with VVER-440 type reactors was to be 815.0 MW, each unit of 407.5 MW. The ANPP design life-time was specified to be 30 years. The comprehensive studies and analyses showed that seismic conditions of the ANPP site were characterized by the level that corresponded to the eight-point intensity according to MSK-64 scale. It was the first nuclear power plant in the USSR intended to be constructed in a region of high seismicity. The specific nature of the ANPP site - its seismicity - caused significant changes in VVER-440/230 design, not only in construction, but also in design of the reactor facility in the whole, and the reactor was assigned with the new identification – V-270. It was based on the project of Unit 3 and 4 of the Novovoronezh NPP. The reactor building, auxiliary building, ventilation stack, as well as the buildings and structures containing equipment and instrumentation of safety systems or safety-related on-line systems and communications connecting these structures were assigned with category of High Importance. They were considered to have one point more seismic resistance than that of the ANPP site. The ANPP was commissioned in 1976, achieving initial criticality for Unit 1 on 22 December, 1976, and for Unit 2 on 5 January 1980. The units were put into commercial operation on 6 October, 1977 and 3 May, 1980, respectively. (Unit 3, Unit 4) were dug through. But following the Chernobyl disaster of 1986 the Government of the Republic made a decision to refuse further expansion of the ANPP. The construction work was stopped. After the 1988 earthquake, although the ANPP was not damaged, the Council of Ministers of the USSR decreed to shut down the ANPP as a precautionary measure. Unit 1 was shut down on 25 February, 1989 and Unit 2 on 18 March, 1989. The units were not decommissioned, but kept in prolonged shut down condition. In April 1993, the Government of Armenia decided to restart Unit 2 of the ANPP in order to overcome the severe economic crisis, taking into account the lack in national energy resources. Following 6.5 years of outage, with the technical and financial help of the Russian Federation, Unit 2 of the ANPP was restarted in November 5, 1995. Unit 1 remained in a stand-still regime. After the ANPP restart, 33.54 billion kWh of electric energy has been generated by January 1, 2012, keeping the load schedule of Armenian power system. According to the Governmental decree N 98, 04.04.1996, the CJSC "Armenian NPP" was created and authorized to be the Operator of nuclear power plant. For other purposes, such as liability to foreign countries, the State is assumed to be the operator. In Armenia, the ANPP is under state ownership according to the Law on "Safe Use of Nuclear Energy for Peaceful Purposes". In the past, the ANPP had debt for the fresh nuclear fuel deliveries from the fuel supplier (Russian Federation). To cover that debt and in order to have the fresh nuclear fuel supply to the ANPP without delays, on 17 of September 2003, Government decree N 1211 was issued "On Transfer into the Trust Management of the Rights Certified by the Shares". According to this decree, the agreement was signed between the Inter RAO EES and the Ministry of Energy of RA on transfer, for 5 years, of 100 % of shares of the ANPP to the Inter RAO EES of Russia, and the former is to fulfil the financial management of the ANPP. Inter RAO EES is obliged to deliver fresh nuclear fuel to the ANPP in time. The Russian side was responsible for the management of the plant financial flows. The nuclear power plant remains the property of the RoA. On 4 December 2008, Government decree N 1411 was issued "On Transfer into the Trust Management of the Rights Certified by the Shares", according to which the financial management of the ANPP by Inter RAO EES was extended for 5 years. However, taking into account the fact that OJSC “Inter RAO EES” applied to the Ministry of Energy and Natural Resources for early termination of the trust management agreement, the Government of the RoA by decision No. 227 of March 1, 2012 “On Early Termination of Agreement on Trust Management of the Rights of “Armenian Nuclear Power Plant” CJSC Certified by Shares and Making Supplements to the Government Decision No. 1694 of November 6, 2003” authorised the Minister of Energy and Natural Resources on behalf of the Republic of Armenia to sign an agreement with OJSC “Inter RAO EES” on early termination of the agreement on Trust Management of the Rights of “Armenian Nuclear Power Plant” CJSC Certified by 100% Shares. The Armenian Nuclear Regulatory Authority (the ANRA) – was established in 1993. The ANRA was authorized to be the regulatory body in the area of nuclear and radiation safety, to perform inspection activities and issue the licenses for the appropriate applications (See more detailed information in Section 3.1.). The Ministry of Energy of RA was established in 1992 and on 18.04.2008, by presidential order, became the Ministry of Energy and Natural Resources of RA. During the period of preparation for the ANPP restart (1993-1996), the Armatomenergo was established under the Ministry of Energy. Armatomenergo was authorized with the functions of Operator of the ANPP. On 4 April, 1996, by Government decree N 98, the operation of the "Armatomenergo" was ceased, and the CJSC "Armenian NPP" was given the functions of Operator. At the same time, the Department of Atomic Energy was established at the Ministry of Energy of RA. The Department participates in the elaboration of Armenian energy and nuclear energy development strategy, organizes the development of a list of measures on the ANPP safety upgrading and decommissioning program; collaborates with the IAEA and other international nuclear energy organizations. The "Armatom" Institute - was established in 1973. Having been providing engineering support to the ANPP, the Institute includes in its activity such work as: implementation at the ANPP of diagnostic systems; implementation of Safety Parameters Display System (SPDS), development of compact and multi-functional simulators. "Armatom" is participating in development of "Deterministic Analysis of ANPP Unit 2" and "Probabilistic Safety Analysis of ANPP Unit 2" documents. CJSC "Atomservice" - was established in 1987. The company took active part in the plant systems adjusting and testing programs implementation during the period of preparation for the ANPP Unit 2 restart. It continues to perform the same activity nowadays. CJSC "Atomenergoseismoproject" - was established in 1983. During the period of restart preparation of Unit 2 of the ANPP, a set of works on finishing investigations of the plant seismic conditions was performed by CJSC "Atomenergoseismoproject" for final resolution on all the issues relevant to the plant restart and further operation. One of the major results of conducted investigations was that the ANPP has been erected on a whole (non-destructed) basalt block, i.e. absence of a tectonically active break under the ANPP site was proven. At present, CJSC "Atomenergoseismoproject" is part of the “Scientific Research Institute of Energy” CJSC. There are several construction, repair, mounting and other organizations also related with the operation of the ANPP. In Armenia, All-Armenian Atomic Power Engineers Association has been established. The founders of the Association are specialists from such organizations as the Ministry of Energy of RA, ANPP, ANRA, State Engineering University (SEUA), and other nuclear power specialists. • creating computer training and demonstration programs. The ANPP consists of two VVER-440 type nuclear power units. Both units of the ANPP with the VVER- 440 (V-270) type reactors were designed and constructed by organizations of the former Soviet Union under the supervision of the Ministry of Energy and Electrification of the USSR. The design of the first stage of the plant was developed in 1969-1970. The chief scientific supervisor was Kurchatov Institute of Atomic Energy (Moscow). Now it is called RNC “Kurchatov Institute”. The chief design organization was Thermoelectroproect (TEP), Gorki. Now it is called NIAEP, Nizhny Novgorod. The main reactor construction organization was OKB “Gidropress”, Podolsk. The “Izhora Factory” Leningrad Enterprise was the manufacturer of the reactors and systems. The turbines were manufactured by the Kharkov Turbine Plant (KHTP). The electric generators were supplied by the “Electrosila” plant of Leningrad. The building-construction work was performed by the “Gidroenergostroy”, Yerevan. Since 1989, Unit 1 remained in a stand-still regime. Since its restart (1995), Unit 2 of the ANPP has been in operation. Unit 2 has an installed gross capacity is 407.5 MW. All the nuclear fuel necessary for the ANPP operation was delivered in the past and is currently being delivered by the “TVEL” Concern of Russian Federation. Table 7 shows the status and some other indicators of the nuclear power units of the ANPP. In 2005, the ANPP generated 2.72 billion kWh, which is its maximum generation since the ANPP restart. The main organizations and institutions involved in nuclear energy in Armenia are: the Ministry of Energy and Natural Resources, The Nuclear Safety Regulation State Committee under the Government of RA (still referred to as “ANRA”), CJSC “ANPP”, CJSC “Armatom”, CJSC “Atomservice” and CJSC “Atomenergoseismoproject”. Some technical support has been provided by organizations of the Russian Federation, e.g. OKB “Gidropress” - main reactor designer; “NIIAEP Nizhnii Novgorod” - main NPP designer; RNC “Kurchatov Institute” – scientific management, and others. In 1995, Unit 2 of the ANPP had five emergency events of level “0” on the International Nuclear Event Scale (INES) (below scale, deviation). 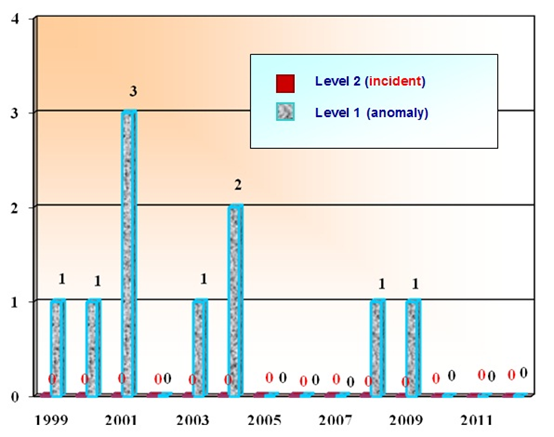 In 1996, 8 emergency events occurred at the ANPP, including: 1 – of level “1” (anomaly), 7 of level “0” on the INES scale. In 1997, 5 emergency events occurred at the ANPP, including: 2– of level “1”, 3 of level “0” on the INES scale. In 1998, 7 emergency events occurred at the ANPP, including: 2– of level “2”, 1– of level “1” and 4 of level “0” on the INES scale. In 1999, one emergency shutdown and one event of level “1” occurred. In 2000, there were 3 events reported, one event was rated level “1”, and two events were rated level “0”. In 2001, 8 emergency events occurred at the ANPP, including: 3 – of level “1”, 5 of level “0” on the INES scale. In 2002, 8 emergency events of level “0” on the INES scale occurred at the ANPP. There were 2 emergency shutdowns. In 2003, there were 2 emergency events, 1 of level “0” and 1 of level “1” on the INES scale. There was 1 emergency shutdown in 2003. In 2004, there were 2 emergency events of level “1” on the INES scale. In 2005, 2006 and 2007 no emergency event on the INES scale occurred. In 2008, during the operation of Unit 2 of the ANPP, 1 event of "1" by INES was registered, and the reactor was scrammed which was caused by an accident in the grid. In 2009, there were 5 recorded events in the plant operation, 4 events were classified according to INES level “0” and one event was classified as safety significant level “1”event on the INES scale. In 2010, there were 7 recorded events in the plant operation and all events were classified according to INES level “0”. In 2011, there were 4 recorded events in the plant operation and all events were classified according to INES level “0”. In 2012, during the operation of Unit 2 of the ANPP, 2 events of "0" by INES were registered. The reactor was not scrammed. Figure 4 shows the dynamics of the significant safety events based on INES scale. The issues of the ANPP safety upgrading are of great importance for the Armenian Ministry of Energy and Natural Resources. The safety level of the ANPP during times of very limited financial resources was one of the main concerns of the Armenian Government. After numerous consultations with experts from the USA, Western European countries and the Russian Federation, being also assisted by the experts from the IAEA, Armenian specialists developed a new programme of the ANPP safety-upgrading. It was called “List of safety upgrading activities for the period of 2009 – 2016 of Unit 2 of the Armenian NPP”. The safety upgrading process, having been permanently implemented at the ANPP, is being realized according to the provisions of that program. 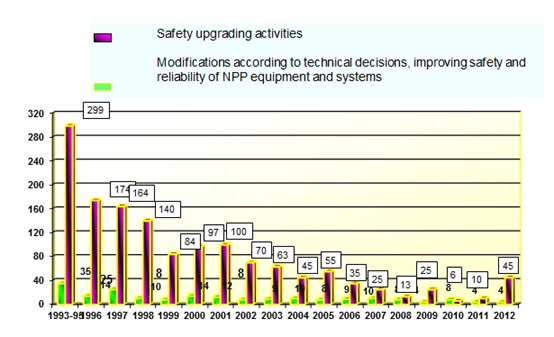 Since the restart of the ANPP and up to 01.01.2013, more than 200 Safety upgrading activities and 1450 safety improvement measures (Modifications according to technical decisions, improving safety and reliability of NPP equipment and systems) have been completed, so the plant can withstand emergency situations without failures. Historical annual upgrading measures are shown in Figure 5. In the summer of 2005, the Director General of the IAEA, Mr. El Baradei, came to visit Armenia. During the high-level meeting, he assured the Armenian side that the IAEA will assist to coordinate the activities on the upgrading of the ANPP with the donor countries. On 18-19 May 2010, the 4th IAEA working meeting was held on Coordination of International assistance to the ANPP safety upgrading in Yerevan. The decision was made to review the existing “List of safety upgrading activities for the period of 2009 – 2016 of Unit 2 of the Armenian NPP” on the base of the SAR and PSA documents. On October 13-14, 2011, the 5th IAEA working meeting for co-ordination of international technical assistance to Armenian NPP was held in Vienna. The meeting was attended by representatives of Armenia, European Commission, Russia, IAEA, US DOE and Czech Republic. A number of issues were discussed to prioritize improvements and co-ordinate the activity of ANPP support organizations, aimed at maximum coordinating actions for implementation of each specific project. • the issues related to the continuation of coordination works for increasing the safety level of ANPP #2, technical assistance aimed at increasing its safety level and strengthening its security through physical protection. Technical assistance for decommissioning the ANPP was also discussed. • the issues related to strengthening the capacity of RA State Nuclear Safety Regulatory Committee by the Government, technical assistance in activities during various stages of licensing process of new nuclear power unit in RA. • the long-term development projects in radiation therapy were also discussed. The IAEA delegation visited the ANPP and took at tour of its operating unit. Activities, according to the program, for increasing the safety and security level of ANPP #2 and the further plans were presented to them. Since 1996, the Nuclear Energy Safety Council under the President of RA has been acting in Armenia. Its general duty is to report annually to the President on the real situation of the nuclear energy safety at the ANPP. The members of the Council thoroughly observe the relevant documents and appropriate specialists reports before reporting to the President. The Council consists of internationally acknowledged specialists, well known within the world nuclear energy. In December 2011, the 12th Council Conference took place in Yerevan. The Ministry of Energy and Natural Resources, which defines the policy for the whole energy sector, is in particular responsible for the development of the ANPP safe operation programs in, close cooperation with other responsible bodies. The IAEA assembled an international team of experts at the request of the Government of the Republic of Armenia to conduct an Operational Safety Review (OSART) of the NPP. Under the leadership of the IAEA, Division of Nuclear Installation Safety, the OSART team performed an in-depth operational safety review in May, 2011. The OSART team conducted an “in-depth review” of the aspects essential to the safe operation of the ANPP. The conclusions of the review are based on the IAEA Safety Standards and proven good international practices. The OSART team has made 14 recommendations and 12 suggestions related to areas where operational safety of ANPP could be improved. Also, the OSART team has identified good plant practices which will be shared with the rest of the nuclear industry for consideration of their application. ANPP has already developed a detailed plan of action for implementation of these recommendations and assignments, which has already started. In June, 2013, IAEA review mission will visit ANPP to revise the implementation of assignments and recommendations of the OSART mission. After the earthquake and tsunami in Fukushima, in 2011, Armenia expressed readiness to conduct "stress tests" at the ANPP in accordance with the approach of Western European Nuclear Regulation. By means of the EU fund and with assistance of Belgian company Traktebel, the ANPP is carrying out the "stress test". The final report of the “Stress-test" of the ANPP will be submitted to the Armenian Nuclear Regulatory Authority in July of 2013, and will be transferred to the EU after approval. The Energy Policy of Armenia is focused on realization of the strategy program for providing the country with the required quantity of electric energy and gas. the use of both the thermal and nuclear power plants. The second option of the Energy sector development, taking into account the criteria of energy safety and energy independence, ecology, as well as the social point of view, was preferable. On the base of this study, the “Least Cost Generation Plan” and “The Comprehensive National Energy Strategy and Energy Sector Improvement Action Plan” were developed in 2006. Based on these two documents, “The Armenian Ministry of Energy Action Program According to the National Security Strategy” was adopted by Government decree N1296 of 1.11.2007. With this program, it was envisaged to put into operation the new nuclear power unit (s) immediately after the shutdown of the existing one, to cover the lack of capacity. According to that document, taking into consideration the needs of country energy independence, the preference was given to 1000 MW nuclear power units. At present, the Ministry of Energy and Natural Resources of the Republic of Armenia, assisted by the USAID Project for assistance to the energy sector of Armenia for Energy Security and Regional Integration, is reviewing “Environmental Background Information Document” aimed at establishment of a new document – “Armenia New Nuclear Unit Environmental Report”. Public hearings on the Armenia New Nuclear Unit Environmental (Environmental Impact Assessment) Report were conducted on May 17, 2011, in Armavir and on May 24 in Gyumri. Based on the comments and recommendations made during those hearings, the report was expanded and submitted to the Ministry of Nature Protection of the RoA. The Ministry of Natural Protection informed that it does not have principle comments about the Armenia New Nuclear Unit Environmental (Environmental Impact Assessment) Report and will provide a final conclusion after the results of design activities are incorporated in the final report. The Law of the Republic of Armenia “On Construction of a New NPP in the Republic of Armenia” was adopted 27 October, 2009, which serves as the legal basis for construction of a new NPP in Armenia; according to the Armenia Law “On Safe Usage of Nuclear Energy in Peaceful Purposes”, construction in the republic of a new NPP or decommissioning of the existing NPP are possible only after adoption of a relevant law. Decree “On Establishment of a Closed Joint-Stock Company Aimed at Construction of a New NPP in the Republic of Armenia” was adopted by the Government of Armenia on 3 December, 2009. “Metsamorenergoatom” CJSC was established with the involvement of RA Government and “Atomstroyexport” CJSC, which was delegated by “Rosatom” Russian State Corporation. The established, “Metsamorenergoatom” CJSC is open for other investors as well. Investigations of development of a new 400 kV network in Armenia (new Voltage level in the country), as well as its expansion to neighbouring power systems have been done by Energy Network Design Institute of Armenia in the project “Development of the Armenian electrical grid scheme (2010, 2015, 2020)”. To ensure the admissible voltage level and to reduce active power losses in the electrical grid, it is desirable to construct a new 400/220 kV substation, “Noravan,” with input/output of double circuit “Iran-Armenia” HVL of 400 kV. It is necessary to install a reactance in the Hrazdan TPP 400 kV substation to ensure the allowable voltage levels and adjust reactive power flow. Calculations of short circuit currents show that there is no need to replace any equipment in existing substations, or any extraordinary additional equipment in a new 400 kV network. Connection of a new 400 kV OHL and increasing of electricity export to the neighbour power systems will highly reduce the risk of unstable operation of the ANPP and power system as a whole. A seismic hazard assessment of the ANPP site has been performed with funds of the RoA. The terms of reference for the seismic hazard assessment of the ANPP site were developed and agreed with IAEA. The draft report of the site seismic hazard assessment was submitted for expert review to IAEA in August, 2010. The IAEA Mission reviewing the seismic hazard assessment provided a number of comments and recommendations for completion of the seismic hazard assessment. The “Seismic Hazard Assessment for the Construction Site of a New Power Unit at the Armenian NPP – Final Report” was completed in February, 2011 based on the latest IAEA guidance. The report also includes a “Volcanic Hazard Assessment of the Armenia Nuclear Power Plant Site”. Positive review was received from IAEA of the final report. The final report of IAEA experts on the final version of the seismic and volcanic hazard assessments was provided to the Armenian party in December, 2011. The IAEA Second Mission provided comments of editorial nature and recommended to carry out additional investigations regarding the Yerevan fault. “Metsamorenergoatom” CJSC has received the license for selection of the site for the construction of the new unit. “Metsamorenergoatom” CJSC will be the operational organization for the Armenian New Nuclear Unit. "The Armenian Nuclear Power Plant" CJSC is the Armenian nuclear power plant's operating organization. The ANPP Decommissioning Strategy was adopted by the Government of Armenia in November 2007. Under the framework of Action Plan of EU Neighbourhood Policy, negotiations are being carried out on the matter of providing technical assistance for development of the ANPP Decommissioning Plan, as well as development of a Radioactive Waste Strategy. Further progress will mostly depend on ANPP Decommissioning Plan. Armenia has no nuclear fuel cycle industry and uses an open nuclear fuel cycle scheme. Up to now, all the nuclear fuel has been supplied by Russia. Originally, the spent nuclear fuel generated by the ANPP was managed by the Soviet Union central agencies of reprocessing and final disposal of spent nuclear fuel. The recovered uranium and plutonium were retained by the central agencies in the Soviet Union. Since the restart of Unit 2, spent nuclear fuel has been retained on the ANPP site. The ANPP is operating with a three-year fuel cycle. The spent nuclear fuel, before its transfer to the dry storage, is kept in wet nuclear fuel storage in the reactor building - fuel ponds. In 2000, the construction of the first stage of the spent fuel dry storage was completed. The construction was commissioned by the French firm Framatom and financed by the French Government. The spent fuel dry storage facility has been put into operation, and all the transportation of spent fuel is performed according to the requirements of the license given by the ANRA. Now, all the volume of the first stage of storage is filled with spent fuel. In 2005, an agreement was signed with French company TN International for construction of the additional three stages of the dry storage facility. The financing was allocated from the State budget of RA. The second stage was completed and put into operation in spring 2008. The first part of the spent nuclear fuel has been transferred into dry storage. The third stage of spent fuel dry storage construction is planned to be started in 2014. By Protocol Decision 19 of the Government of Armenia, Session No. 43 of November 4, 2010, “The Concept for Safe Management of Radioactive Waste and Spent Nuclear Fuel in the Republic of Armenia” was adopted. According to the Concept, the significant activities anticipated in that area are regulated and distributed between the departments of the Republic of Armenia. Currently, the ANPP is developing a program for management of radioactive waste at ANPP, which will be used in the course of development of document A4.01/09 “Strategy for Radioactive Waste Management in the Republic of Armenia” provided for the program of the Republic of Armenia and European Commission “Nuclear Safety Activities for 2009”. The final spent fuel and high-level radwaste treatment and disposal concept will be developed and included in the ANPP Decommissioning Program. According to the ANPP design, the annual Unit 2 radioactive waste (radwaste) generation is: 308 m3 of solid LLW; 1. 5 m3 of solid MLW; 0.3 m3 of solid HLW; 108 m3 of liquid MLW. At the ANPP, there are storages for both solid and liquid radwaste. High-level waste is stored in a special room of the Reactor building. The storage area consists of 380 cells. The storage capacity is 78.34 m3. Medium-level radwaste is stored in the Special Building. Storage capacity is 1001.22 m3. Also, the deep evaporating facility containers are stored temporarily on the upper unheated floor of the Special Building. Its effective storage volume is 655 m2 (3000 containers). Liquid radwaste is stored in the Special Building. Liquid wastes (evaporator residues) generated in the evaporators during drain water reprocessing are collected in the evaporator residue tank. The storage facility for low-level radwaste consists of two compartments, each measuring 27x36x8.9 m. The total storage volume is about 17050 m3. In March of 2007, the “Radioactive Waste Decontamination” CJSC was transferred under the Ministry of Energy and Natural Resources. Currently, the medical and industrial ionizing sources are kept at the facility. The work is under way to modernize the “Radioactive Waste Decontamination” CJSC storage facility to also keep the middle-level liquid radwaste generated by the ANPP. The main organizations and institutions involved in nuclear energy in Armenia are: CJSC “ANPP”, CJSC “Armatom”, CJSC “Atomservice”, CJSC “Nuclear and Radiation Safety Centre”, CJSC “Tekatomenergo” and CJSC “Scientific Research Institute of Energy”. In 2004, Armenia joined the International Project on Innovative Nuclear Reactors and Fuel Cycles (INPRO), an IAEA initiative, in order to address the needs of economic, safety, non-proliferation and waste management aspects of nuclear energy and its fuel cycle with innovative technology. Armenia fulfilled the Collaborative Project (CP) entitled “Implementation Issues for the Use of Nuclear Power in Smaller Countries”. The project was supported by a number of countries. The results of this CP are providing small countries with the opportunity to discover problems that could arise with the construction of new nuclear units in their countries. Currently, another INPRO “SMALL” CP was performed and the report has been submitted to IAEA for publication. Armenia has bilateral cooperation, mostly concerning safety of the ANPP, with such countries as Argentina, France, Italy, Russian Federation, UK and USA. Armenia also participates in several international projects developed in the framework of co-operation under the aegis of IAEA, EC and USAID. Very close co-operation is established with the IAEA. Armenia has been a member of this organization since 1993. IAEA experts have been participating in many assistance projects since then. When in April of 1993, the Government of Armenia made the decision to restart Unit 2 of the ANPP; the IAEA experts participated actively in pre-commissioning investigations and evaluation of the condition of plant equipment. Moreover, they elaborated the whole concept of Unit 2 re-commissioning. Armenia is collaborating with the IAEA in the field of nuclear safety upgrading. At present, several national programmes of the ANPP Unit 2 safety upgrading are in different phases of implementation. The IAEA is permanently assisting the ANRA, providing them with the appropriate support and recommendations. Since 1996, the US DOE, in the framework of the International Nuclear Safety Program, and EC, within the framework of TACIS Assistance Programs, started implementation of projects aiming at technical assistance in upgrading a level of the ANPP operation, as well as modernization of the plant technological equipment. Over the years, several countries – France, Great Britain, Czech Republic, Italy and Russian Federation (since 2008), have joined the Assistance Programs. Armenia cooperates with Argentina in the frame of bilateral project "Creation in Armenia of a Center for training and qualification in Non-Destructive Metal Testing Techniques" with the assistance of the IAEA. There are many joint projects with the Russian Federation within the framework of the Nuclear Safety Assistance Program. In 1996, an agreement was signed between the ANPP and ROSENERGOATOM on industrial and technical-scientific co-operation. In 2000, the agreement was signed between the Governments of RA and RF on "Cooperation in the field of peaceful use of nuclear energy". In the frame of bilateral cooperation between the two countries, Armenia and USA, in 2001, within the "Armatom" institute of RA, the International Nuclear Safety Center of Armenia was created. The Joint Statement on cooperation between International Nuclear Safety Centers of Armenia and USA was signed on 07.02.2001. Since 1996, the ANPP is a member of World Association of Nuclear Operators (WANO). The Moscow Centre of WANO has commissioned two inspections relevant to the ANPP operational safety. The ANRA has agreements for co-operation with nuclear regulatory authorities of the following countries: Russia, USA, Argentina and Ukraine. The ANRA is a member of the FORUM organization, whose members are the nuclear regulatory authorities from the countries operating VVERs. The ANRA participates also in the CONCERT Group work. In 2007, the Government of Armenia made the decision for the RoA to join the agreement between the Governments of the Republic of Kazakhstan and Russian Federation on establishment in Angarsk of International Uranium Enrichment Center. In view of energy security and energy independence, Armenia gives a special attention to development of nuclear energy in the country. Activities commenced towards construction of a new nuclear unit in Armenia since 2008. A Law of the RoA “On Construction of a New NPP in the Republic of Armenia” was adopted on 27 October, 2009, which serves as the legal basis for construction of a new NPP in Armenia. The need for qualified specialists is becoming an ultimate necessity for Armenia with regard to construction of new nuclear units as well as for operation, continuous safety improvement and decommissioning of the ANPP. Armenia is the only country in the entire Caucasus region that is operating a nuclear power plant for over 30 years. Qualified specialists are required for the already existing ANPP, ANRA, Nuclear and Radiation Safety Centre, ARMATOM and other research institutes to address issues and challenges in view of new developments of nuclear energy in Armenia. Armenia has two main institutions preparing nuclear experts: the State Engineering University of Armenia (SEUA-Polytechnic) and Yerevan State University. Armenian specialists from ANRA, the nuclear power plant and support organizations participate in scientific visits and training in Europe, the US and other countries. This is conducted under IAEA Technical Cooperation projects and international aid programs. To increase the quality of nuclear specialists, currently, two departments of the Yerevan State University and the State Engineering University of Armenia give specialization in the field of nuclear energy. However, enhancement of Integrated Education System for Nuclear Sector in Armenia is essential. Therefore, a Concept on human resources management is approved by the Government of the RoA. Implementation of Knowledge Management for all phases, including design, construction and commissioning, operation and decommissioning, both for the existing and future NPP units, are the main parts of the Concept. An evaluation of human resource needs in conjunction with the new NPP in Armenia was conducted under IAEA Technical Cooperation Project ARM-005. The report of that evaluation feasibility study of nuclear energy development in Armenia titled “Evaluation of Human Resource Needs in Conjunction with New NPP Build” was completed in 2008 and was published as an IAEA TECDOC-1656 “Evaluation of Human Resource Needs for a New Nuclear Power Plant: Armenian Case Study” in 2011. The analysis, which covers all stages of construction of the new nuclear power unit, relates both to the sponsoring organization and to the regulatory agency dealing with nuclear power in Armenia. Item 11 of the Protocol of GoA Session No. 26 dated 8 July, 2010, approved a program of subsidies intended to encourage attendance and academic achievements by students in the nuclear field. Under IAEA Technical Cooperation Project ARM-006, IAEA is providing laboratory equipment and training to strengthen educational programs at the State Engineering University of Armenia (SEUA) and Yerevan State University (YSU). At SEUA, IAEA installed a VVER-1000 unit simulator for training purposes. Under USAID Armenia project Aid to the Energy Sector to Strengthen Energy Security and Regional Integration, a task has been completed in support of curriculum development at SEUA and YSU to restructure and improve the curricula in nuclear engineering and nuclear physics and increase the knowledge level of university graduates entering the nuclear workforce. A new IAEA Technical Cooperation Project is being initiated to provide IAEA assistance in reviewing relevant permission/license documents and in creation of corresponding infrastructure for new nuclear unit. Curricula for the Bachelor and Master levels of specialties re-established at SEUA and YSU according to the above mentioned Government decision were developed. Significant expansion of staffing at the Ministry of Energy and Natural Resources and CJSC “MetsamorEnergoAtom” to support new unit design and procurement is expected after selection of strategic partners and investors. RA’s contract with Worley Parsons (as the Management Company for the new NPP) requires that they develop specific training plans for personnel working at the preconstruction phase and construction phase of the project and for personnel responsible for project safety. Training and development of Nuclear Power sector managers. The state authority for supervision of nuclear and radiation safety was established by the Government decree N573, 16.11.1993. It was called the State Department for Supervision on Nuclear and Radiation Safety of Utilization of Nuclear Energy at the Government of RA. By the same decree, the Department Statute was approved and the authority was charged with the functions of inspections. By the Government decree N70, 19.02.2000, the Department was authorized to also have the regulating functions, and, according to that decree, it prepared a new Statute which was approved by Governmental decree N385, 22.06.2000. The Department was given a new name - Armenian Nuclear Regulatory Authority (ANRA) in accordance with that decree. The ANRA was under a direct subordination of the Armenian Government and independent from those organizations responsible for development and utilization of atomic energy. According to its new Statute, the ANRA was to organize and perform state supervision and inspections over utilization of nuclear energy, as well as its regulation. On 24 of May, 2001, according to Government decree N 452, the ANRA was awarded with the authorization of State regulation on protection against the irradiation from ionizing radiation sources and their safety. The status of the ANRA was changed again on 27 of June, 2002, according to Government decree N 912, in order to respond to the reforming principles implemented into the Armenian System of Government Management. The ANRA was included in the Ministry of Environmental Protection of RA. On 26 December, 2002, the new Statute of the ANRA was approved by Government decree N 2183. The ANRA was re-named to be the Inspectorate for State Supervision on Nuclear and Radiation Safety of Utilization of Nuclear Energy under the Ministry of Environmental Protection of RA. According to the new Statute, the ANRA was authorized with the following key duties: to perform the State regulation within the field of nuclear energy utilization with the main objective to secure the protection of the population, the personnel involved in the nuclear industry, and the environment. In accordance with the Ordinance of the President of Armenia adopted on 20 May, 2008, the ANRA was reorganized into the State Committee on Nuclear Safety Regulation under the Government of the RA. Now, ANRA’s task is the state regulation of atomic energy utilization (safety of nuclear facilities, the safe use of ionizing radiation sources, the safe management of radioactive waste, and the safe transport of radioactive and nuclear materials) aimed to ensure the safety of population and personnel, environmental safety and to defend safety interests of the RoA. Inform ANRA on the deviations of the conditions of the temporary operation permission, as well as the incidents and emergencies during NPP Unit operation. On 25 April, 2001, according to Government decree N 342, the Science-Research Centre of Nuclear and Radiation Safety was established at the ANRA, with the aim to enable the ANRA to carry out an independent expertise activity. On the base of Government decree N 389, 22.08.1994, all the rules and norms applicable to nuclear power in Russia were accepted in Armenia. The ANRA is aware of the fact that some of those regulations need revision. This process is constantly underway. According to Government decree N 252, 7.04.2007 “On Abrogation of the Government Decree N 389, 22.08.1994 and Item 2 of the Government Decree N 239, 20.04.1999” the Government decrees No. 389, 22.08.1994 “On Nuclear Power Plant Safety Norms and Rules” and N 239, 7.04.2007 “On the List of Normative Decisions Adopted by Council of Ministers of the Armenian Soviet Socialistic Republic and Effective Before August 23, 1990” became ineffective. Appropriate governmental bodies of Armenia are in the process of developing internal norms and standards for the nuclear sector. The licensing process of the nuclear field is regulated by the Law on “Licensing” and the appropriate decisions of Government of RA. Law on "Implementation of modifications and additions both in the Code of RA on administrative and criminal legal violations", entered into force on 30 November, 1996. Law on "Energy of the Republic of Armenia", entered into force on 1 July, 1997. The new Law on "Energy of the Republic of Armenia" entered into force in March, 2001, and replaced the old one. Law on "Safe Use of Nuclear Energy for Peaceful Purposes" entered into force on 1 March, 1999. A significant amendment to the Law on "Safe Use of Nuclear Energy for Peaceful Purposes" entered into force on 21 March, 2000 and additional amendments and additions are now effective. Law on “Licensing” entered into force on 27 June, 2001. The new Law "On the Export Control for the Goods of Dual Purpose and Technologies and their Transit Transportation through the Territory of Armenia" entered into force in April, 2010 and replaced the previous law on the same topic. The above mentioned Laws, as well as Government decrees and all other legislative and regulative documents are presented in the official web-sites of the National Assembly of RA (www.parliament.am), Government of RA (www.gov.am), Ministry of Energy and Natural Resources of RA (www.minenergy.am) and of ANRA (www.anra.am). "Armenian Economic Trends" issued by the European Commission, DGIA, NIS/TACIS services. Investment Guide of Armenian Development Agency. Reports of , Ministry of the State Statistics. Manual on the Climate Data for the Construction Design in Armenia. IAEA Energy and Economic Database (EEDB). IAEA Power Reactor Information System (PRIS). EC TASIC Project N Europe Aid /112/135/C/SV/Multi " Energy Consumption Forecast"
 Reports 2000 -2010 National Statistical service of the RA. EnergEnergy balances of non-OECD countries. CO2 emissions from fuel combustion, IEA, 2005-2012. Hydropower is based on the water resources of the Republic, including Lake Sevan, one of the largest highland fresh-water lakes in the world (1900 m above sea level), and the rivers: Arax, Arpa, Hrazdan, Debet and Vorotan. During the last period of time, beginning from 1991, 136 new small hydro power plants with a total capacity of 192 MW (538 million kWh of electric energy annually) have been built. Hydro power plants of Sevan-Hrazdan cascade are operating at a low level capacity, because, after the intense use of the lake water during the last crisis, the Government of Armenia decided to reduce releases from Lake Sevan to restore its potential. Water from the lake can be taken only for the irrigation needs. Small HPPs have an installed capacity of 192 MW. At the same time, Armenia still has an unused hydraulic potential (both small and big rivers) of about 346 MW (or 1764 million kWh of electric energy), with development being economically reasonable. Hrazdan TPP has an installed capacity of 1100 MW. Its 4 condensation turbines, each of 200 MW, may be operated, but now only two of them are in operation because of the lack of demand. Now, the Gas- and Steam Turbines Units of Hrazdan TPP with a capacity of about 440 MW was put into operation in April, 2012. Yerevan TPP has an installed capacity of 550 MW, including: 2x150 condensation turbines, and 5x50 heating turbines. Now, only 2x50 MW turbines are in operation because there is no need demand of heat consumption. The Gas Turbine Combined Cycle Unit of Yerevan TPP, with a capacity about 242 MW electrical and 30 MW thermal, was put into operation in April, 2010. Vanadzor TPP has an installed capacity of 94 MW, with different capacity heating turbines. Now, none of them are in operation because there is no need for heat consumption. The results of asset revaluation show that the sector’s main assets resources have already expired. The equipment is worn out and requires major overhaul, 38% of installed capacities are already over 30 years old. It is necessary to take all due measures to renew the energy sector of Armenia. Nuclear Power Plant (NPP) has a designed capacity of 815 MW, of which Unit 2, only with 407.5 MW, is in operation. Nuclear energy played a crucial role during the period of recovery from the economic crisis. Unit 1 is not operating, and unit 2 has been re-commissioned in 1995, after 6.5 years of outage. The fuel is supplied by the Russian Federation. The high-voltage transmission network of Armenia consists of 220-110 kV lines. There are 14 substations of 220 kV and 119 substations of 110 kV. The capacity of the existing high voltage network is considered sufficient for the current and forecasted loads. The high-voltage transmission network has the interconnections with all neighbouring countries: Azerbaijan: 330, 220 and 110 kV (not in operation), Georgia: 220 and 110 kV, Turkey: 220 kV (not in operation), Iran: 2x220 kV. The high-voltage lines Armenia - Iran and Armenia–Georgia of 400 kV are currently under construction. Natural gas is the most important primary energy source, and it is imported primarily from Russia. The designed capacity of the high-pressure gas transportation network of Armenia is 17 billion m3/year. In 1980, the maximum demand for natural gas in Armenia was above 5-6 billion m3/year. There have been five main gas pipelines built, which ensured the gas delivery from three sides: Georgia, North and West Azerbaijan. Today, only the first one is operating. In 2012, the natural gas demand was 2.457 billion m3, but the expected demand by the year 2017 will be 5.5 – 6.2 billion m3/year, depending on the ANPP status (shut down or in operation). The gas pipeline Iran –Armenia is now fully constructed and is in operation since spring 2009, which has the capacity of 2.3 billion m3. There are underground storage facilities for natural gas with a maximal gas storage volume of 180 million m3. Nowadays, the available gas storage volume is 130 million m3. Gas distribution in Armenia is performed through high, medium and low-pressure distribution networks. Oil products are imported from foreign countries, mostly utilized for the transport and industry sector. During the last several years, mazut barely imported into the Republic. As to the renewable energy sources (geothermal, wind, solar and waste burning), they are under study. Armenia has a considerable potential of geothermal energy, but a programme has to be developed to explore the geothermal resources and to carry out drilling activities. The most worth-while regions suitable for the construction of wind power plants are: Vanadzor, Aragats, Lake Sevan basin and Sisian, where the wind velocity reaches 7 m/s. In December 2005, the first wind power plant was put into operation in Pushkin pass (Vanadzor region) with an installed capacity of 2.6 MW. The total capacity of the site is estimated to be 20 MW. Now, investigations are carried out for the construction of wind power plants at other sites, too. Armenia is a sunny country with a high level of solar radiation. Nevertheless, it is too expensive to utilize solar energy, and the country, which appears to have very good solar radiation potential, cannot afford to use it.